The world monetary order is changing. Slowly but steadily, global trade and currency markets are becoming less dollar-centric. Formerly marginal currencies such as the Chinese yuan now stand to become serious competitors to U.S. dollar dominance. Could gold also begin to emerge as a leading currency in world trade? Over time, it certainly could. But the more immediate implications for gold’s monetary role center on its increasing accumulation by central banks such as China’s. On October 1st, the Chinese yuan is slated to enter the International Monetary Fund’s Special Drawing Right (SDR) basket of top-tier currencies. It will share SDR status with the U.S. dollar, euro, British pound, and Japanese yen. King Dollar won’t be dethroned overnight. But the place of prominence the U.S. dollar – more accurately called the Federal Reserve Note – enjoys as the world's reserve currency will indeed diminish over time. China and Russia have mutual geostrategic interests in helping to promote de-dollarization. Toward that end, the two powers are engaging in bilateral trade deals that bypass the dollar. 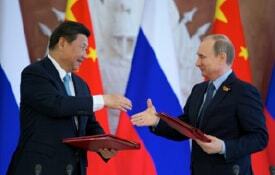 Annual bilateral trade between China and Russia has surged from $16 billion in 2003 to nearly $100 billion today. When China hosts the G20 summit in September, it will make Russian President Vladimir Putin its premier guest of honor. U.S. officials are none too pleased. They fear Putin aims to expand his global reach by forging stronger ties with China. Some in the Hillary Clinton campaign even fear that Russia will interfere in the upcoming U.S. election to try to block Hillary’s path to the White House. Russian hackers have been implicated in a number of recent “leaks” that damaged the reputations of U.S. banks and the Obama administration. Wikileaks founder Julian Assange has hinted at further releases. Hillary’s allies openly speculate that these Wikileaks hacks are being sourced from Russia. But the Russians and the Chinese aren’t counting on cyber warfare to dethrone King Dollar. In addition to bilateral trade deals and strategic plays for regional economic dominance, the two powers are bulking up on gold. Over the past several years, Russia and China have each been adding massively to their gold holdings. Since 2009, China’s officially reported gold holdings have jumped by 60%. The enlarged gold stockpiles held by the People’s Bank of China helped China win ascension into the IMF’s elite SDR currency basket. It’s part of a larger trend of world central banks becoming net gold buyers. They were net sellers throughout much of the 1990s and early 2000s. That helped keep gold prices suppressed. 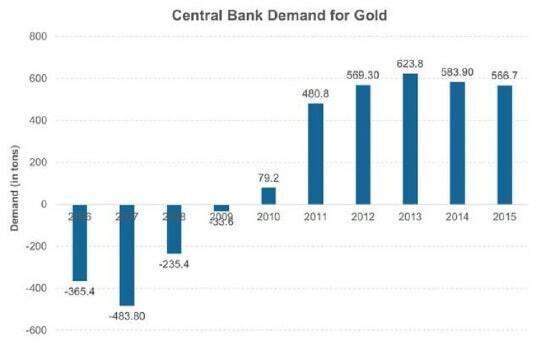 But since 2010, central banks have been net buyers of gold – to the tune of more than 500 tons per year. Russia alone added 172 tons of gold in 2014 and 208 tons in 2015. By swapping some of its U.S. Treasury securities for bullion bars, the Russian central bank has become the world’s seventh largest gold holder. Yet gold makes up just 16.2% of Russia’s monetary reserves, which is a lower proportion held by its Eurozone neighbors. Russia likely isn’t done accumulating. As the world’s third largest gold producer, Russia can readily supply itself with more. A similar scenario figures to play out in China, perhaps even more dramatically so. 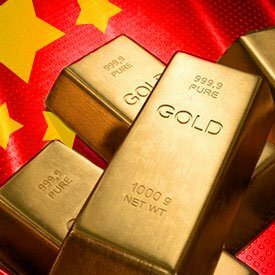 China’s “official” gold hoard of 1,823 tons as of August 2016 gives it the world’s sixth biggest gold reserve. Yet relative to the size of China’s economy and currency supply, its gold stash doesn’t amount to much – just 2.3% of total monetary reserves. Unofficially, China likely has additional gold reserves that it doesn’t report. But even if China’s real gold stash is double or triple what it actually reports, as some analysts suggest, that still leaves the country of 1.3 billion people with far less gold backing than Russia, the United States, Europe, and some of its Asian rivals. China has a lot more gold accumulating to do in the years ahead. Chinese leaders aim to be regionally dominant. In order to secure that position they are moving to own and control greater shares of the gold market. The recently opened Shanghai Gold Exchange gives China a direct mechanism for controlling the physical gold market in Asia. It’s a way for China to take at least some control away from Western governments and banks that have traditionally dominated the gold trade out of London and New York. When the Chinese yuan becomes an SDR currency this fall, that could be the inflection point for a new multi-polar currency regime that sees the Federal Reserve Note decline in stature as central banks scramble to stock up on the ultimate money: gold.